Help raise awareness of the issues & engage the audience in activities to support organic agriculture! During 2010, the producers of What’s Organic About Organic? 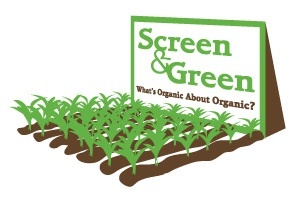 will partner with organic and sustainable agriculture organizations & individuals to host screenings in conjunction with volunteer & awareness-building activities that connect the audience to positive action and involvement in the organic community.Read More! Screen & Green Events can range in scope depending on the programs and activities that your organization conducts. Plan a volunteer day at a farm and kick back at the end of the evening with a movie and a dinner or popcorn! Host a screening at the end of a volunteer board meeting or reception! Collaborate with a local Crop Mob for a day and a movie at night! Host a local potluck dinner or panel discussion followed by a screening! Conduct a composting/window garden/cooking demo/how-to-eat-local-during-winter workshop & follow it with a movie/discussion! The idea is to tack the screening onto existing programming and use the film to enhance what you’re already doing OR to use the film as a way to garner more awareness for an innovative project. Pick a date for a volunteer activity & screening event during Spring 2010. Plan and promote a volunteer activity to get citizens engaged in the work of the organization & introduce them to organic agriculture/food systems. Arrange for a screening of What’s Organic About Organic?’. Select either the 59 min Educational Version or a special 27-minute Workshop Version (a nominal $95 licensing fee is requested). (Optional) Invite a local organic farmer for volunteers to meet and greet at the event or have a panel discussion to go more in-depth. An exclusive copy of What’s Organic About Organic? on DVD and accompanying downloadable classroom curriculum. Special WOAO? 5 Flavor Basil Seed packets from Baker Creek Heirloom Seed Company, Eco-label Pocket Guide from Consumer’s Union for each volunteer & ATTRA magnets and bookmarks. Publicity and promotion for your event via the film’s website, screening map and social media. Opportunity for a reduced rate on bulk DVDs (50% off the retail price) to use as gifts / door prizes or to re-sell and maintain the profits.